Is Canadian National Railway Destined for Greatness? Rail operators have enjoyed the market's favor in recent years, and there are plenty of signs that the rail-transit renaissance should continue. Investors love stocks that consistently beat the Street without getting ahead of their fundamentals and risking a meltdown. The best stocks offer sustainable market-beating gains, with robust and improving financial metrics that support strong price growth. 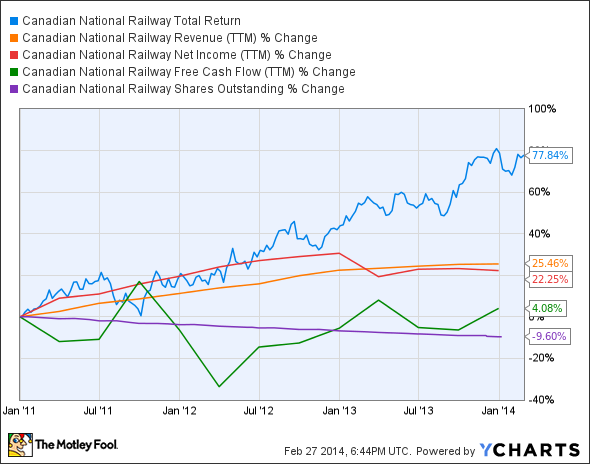 Does Canadian National Railway (NYSE:CNI) fit the bill? Let's take a look at what its recent results tell us about its potential for future gains. CNI Total Return Price data by YCharts. 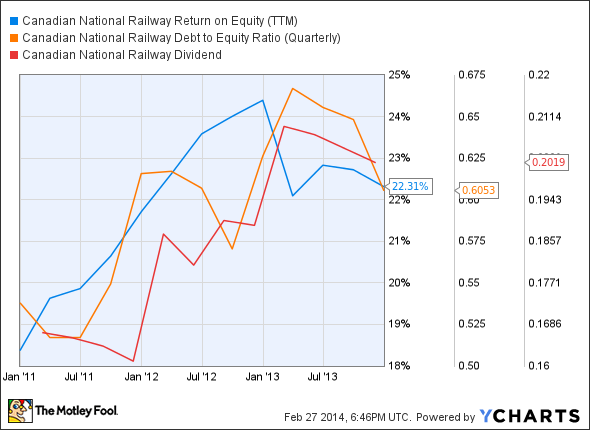 CNI Return on Equity (TTM) data by YCharts. Canadian National Railway avoids breaking down on the tracks, but three out of nine passing grades is hardly a full carload of investing goodness. The company narrowly missed the mark on revenue, profit margin growth, and dividend growth, which does indicate the potential for a much better performance next year. However, Canadian National's stock growth has chugged well past the gains in its net income, which could be bad news for investors going forward if the two metrics converge. But does that mean Canadian Railway should be left at the depot, or should investors ride the rails with this operator for another year or more? Let's dig deeper to find out. Canadian National reported better-than-expected revenue and earnings per share in its latest quarterly results, due to higher petroleum product volumes and a stronger U.S. dollar exchange rate. Fool contributor Justin Lacey notes that Canadian National seems to be capitalizing on a growing oil-by-rail opportunity, as the company's revenue ton-miles for petroleum and chemicals increased by a whopping 20% during the fourth quarter. Moreover, the demand for covered hopper cars has exceeded supply by about 20,000 cars thanks to a record Canadian grain crop and an above-average five-year U.S. yield, which bodes well for Canadian National's revenue growth prospects. However, the U.S. State Department recently released its Final Supplemental Environmental Impact Statement (SEIS) on the proposed Keystone XL pipeline, which could transport more than 800,000 barrels of crude oil per day (BPD) from central Canada to markets in Texas for refining and distribution. The report states that railroads will continue to fill the gap in the absence of a pipeline, which should fare well for Canadian National and rival Canadian Pacific Railway (NYSE:CP) in the near term, as they each have built up a great deal of infrastructure to transport heavy crude oil from the Bakken region. The Keystone pipeline construction push suffered another recent setback after a Nebraska district court invalidated a state law that might have been used to force landowners to let pipelines pass through their properties. However, it seems likely that a pipeline will go into operation eventually -- there's simply too much oil at stake to leave all transport in the hands of the railroads. Fool contributor Dan Caplinger notes that Canadian National and Canadian Pacific have both spent heavily to build better railroad infrastructure to serve customers in energy-rich areas of western Canada. North American railroad operators have a combined capacity to transport 180,000 BPD from Canada to the U.S., with the potential to grow this capacity to 700,000 BPD by the end of 2014. Canexus recently opened a new 100,000-BPD crude-carrying rail terminal near Edmonton, and Kinder Morgan Energy Partners (UNKNOWN:KMP.DL) announced plans to design a $170 million, 100,000 BPD facility in Edmonton, which could eventually grow to a capacity of 250,000 BPD. Additionally, railroad operators are likely to benefit from increased trucking regulation in the U.S., which has limited the average work week for truck drivers to 70 hours. Westport Innovations (NASDAQ:WPRT) also inked a deal to build liquefied natural-gas-powered locomotives for Canadian National, which could result in lower operating costs as long as natural gas remains much cheaper than diesel fuel. Today, Canadian National Railway has few of the qualities that make up a great stock, but no stock is truly perfect. Digging deeper can help you uncover the answers you need to make a great buy -- or to stay away from a stock that's going nowhere.